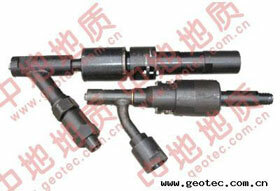 The water swivel is one of many top quality items in Geotec Company. Water swivel is made of pressure-sealed ball bearings, precision machined stainless steel spindles, and light weight aluminum bodies. It is designed to facilitate the introduction of a coolant (normally water) to the inside of the diamond core bit, cooling the bit and removing the cuttings while drilling. During operation, it can undergo the pressure and no leakage occurs. It is also suitable for different threads and mountings. 1) Use quality ground shafts with high performance and long service time. 2) Adopt high quality materials and thread attachments. 5) Have compact sizes and light weight. Φ50 High speed Water Swivel can be used on various drill rigs. We supply 25K and 40K water swivels in complete assembly and spare parts as well. Our products use the international standard material. Custom sizes are always available. Any of the further information, please contact us. We are a professional water swivel manufacturer and supplier in China. We have gained the recognition of a large number of clients through our 20 years' production experience and marketing and serving experience, and meanwhile we have accumulated abundant experience in terms of products. At the same time, we keep researching water swivel that can better meet the clients' needs and the market. Our water swivels have been exported to South America, Africa, East Europe, Southeast Asia, and Middle East. We have clients in America, United Kingdom, France, Canada, Australia, New Zealand, Philippines, Indonesia, India, Chile, Brazil, Russia, Algeria, Morocco, Malaysia, Thailand, Pakistan, Mongolia etc. Located in Wuxi, near Shanghai, the biggest port city of China, we are provided with convenient transportations of any kind, by land, sea or air, which will greatly reduce your transportation cost. To meet the clients' different demands, we can provide all kinds of geological drilling tools, such as diamond core bits (synthetic natural), reaming shells PDC bits, core barrels overshot, drill rods. If you need them, please contact us.